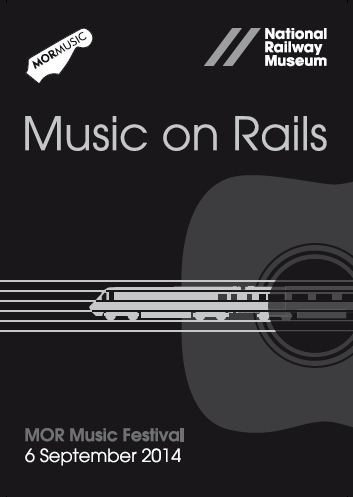 Music on Rails 2014 is a unique collaboration between Fossgate-based music store, MOR Music and York’s National Railway Museum which will see over 20 acts performing from 3pm until midnight at the NRM on September 6th. The event follows on from the hugely successful MOR music festival which was held last year in York city centre and has this year secured a place in the National Railway Museum which will see larger acts performing in the main station hall and acoustic/solo artists performing inside a moving train carriage on the Director’s Saloon stage. A wide range of acts will be performing, many of whom will be familiar to those who frequent York’s various music pubs and clubs. Heading up the Director’s Salook is Beth McCarthy, who appeared on the last series of BBC’s The Voice, along with Laura Kindelan, According to Eve, Plumhall, Toby Burras, Aimie J Ryan, York renowned folk musician David Ward Maclean, Holly Taymar, and Boss Caine. The Director’s Saloon is actually a moving train! 30 people can fit into the carriage each time and are taken on a 30 minute journey whilst the musician performs. The main stage will feature, Speakeasy Blues Band, soul-funk group Barcode Zebra, Rodeo Falls, The Mighty & The Moon, Berlin Black, Littlemores, Vinnie & The Stars, Mark Wynn, FUNKtion, Van Der Neer, We Could Be Astronauts, The Buccaneers and well-known indie-powerpop group The Blueprints. The event is free to attend and takes place at the National Railway Museum, Leeman Road between 2pm and Midnight with bands starting at 3pm. Free tickets must be obtained for the Director’s Saloon stage as space is limited, for more information visit the NRM website.